Don’t say Neigh – go for the photo finish with an equestrian wedding! Are you a horse lover? 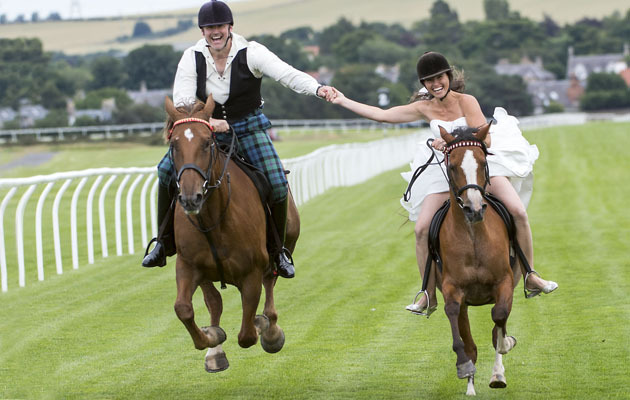 How about holding your wedding ceremony at a racetrack or favourite equestrian venue, like this lovely couple did? Unlike in Scotland, the law of England and Wales won’t permit a wedding unless it is under a fixed roof… However, you can do just the legal registration of the marriage at the register office (£35 each to give notice at your local office, then £50 for the Registration for you and 2 witnesses), leaving you free to arrange a completely bespoke wedding ceremony wherever you like – and it doesn’t need to be at a licensed venue! So, if the local racetrack or polo club or even the paddock at home is where you would like to say “We Do” – give me a call and I can help make it happen with a Cherish Ceremony! Article in the Daily Mail: Major Chris Baird-Clark and bride Shelley got married life off to a winning start with a gallop at Musselburgh Racecourse. The Major was astride his chestnut Irish Draught, Rosie, while Shelley rode her bay coloured Arab, Mimi.